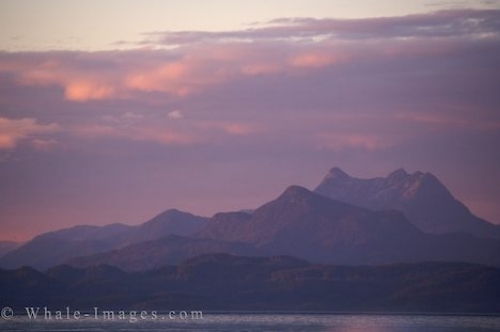 The mountain peaks still display a small amount of snow as the pinkish hues from the sunset alter the color of the world around Northern Vancouver Island in British Columbia, Canada. Calm ocean waters, tiers of mountain peaks with the highest one still housing some snow and the pink coloured clouds at sunset makes Northern Vancouver Island one of the prettiest places in British Columbia. The stillness that surrounds the area is uncanny as the world becomes such a tranquil place around the sunset hours. During the summer season up until early Fall, the whales seem to spend a great deal of time around Northern Vancouver Island and can surface at any given time. As beautiful as this mountain picture is with the sunset at its prime viewing time, a pod of Killer Whales would add an extra special touch to the outstanding scenery off Northern Vancouver Island. If you are out on a boat off Northern Vancouver Island in British Columbia, take the time to hang around until the onset of sunset and watch the sky take on new colors. As thick as these clouds may seem, the sun can still cast its rays for miles creating a picture of beauty above the mountain peaks.